At around noon on October 1 , Jambojet airline, in a unique marketing move, ‘hijacked’ a van load of passengers who were just about to depart on a Prestige Shuttle Vehicle from their boarding office in Nairobi to Kisumu city, 344 kilometers away. Some of the stunned passengers thought it was prank by NASWA, an unpopular TV show, being secretly filmed and refused to disembark! However, for the lucky 11 passengers who very reluctantly accepted the offer to fly to Kisumu (albeit after the Jambojet crew had produced their staff badges), they made their way to JKIA and were checked in for a 14:50 flight to Kisumu. Jambojet pampered the shuttle passengers who now accepted that this was no stunt with snacks after check in. For the first time fliers, they were excited beyond measure as they boarded a plane for the first time and warmly welcomed by the crew on board – and covering the event were some media houses and fellow bloggers. 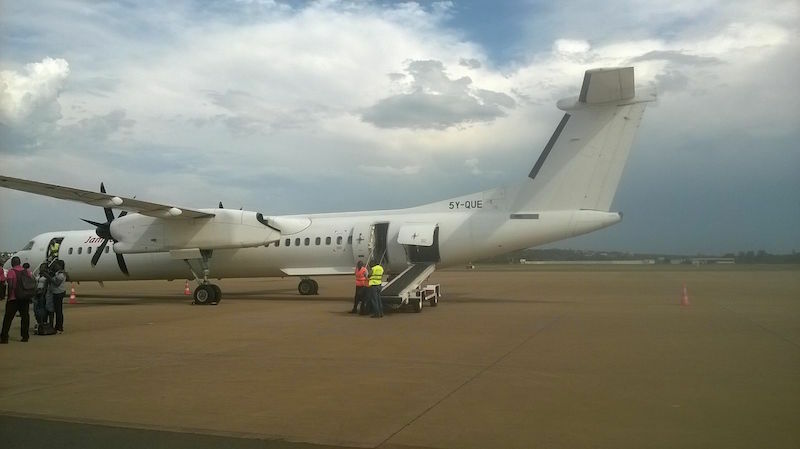 Jambojet has two Bombardier Q400s that are leased from a local aviation firm, DAC, as well as two Boeing 737-300s. This Kisumu flight was on a Q400 that seats 78 passengers in a comfortable cabin with generous legroom. The 737s are mostly used on the Nairobi-Mombasa route and the Q400s for the JamboJet flights to Kisumu, Eldoret, Ukunda, Lamu and Malindi. Jambojet is an offshoot of Kenya Airways designed to introduce the low-cost airline travel model in Kenya. Only ten staff from KQ originally transitioned from KQ to Jambojet and so most of the crew was new to the airline. 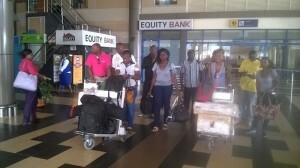 After just 35 minutes, the crew executed a smooth touchdown into Kisumu airport, whose who’s terminal was opened a few years ago after extensive expansion works were completed creating an attractive new feel at the airport in contrast to the old terminal which had a rustic laid back village look. 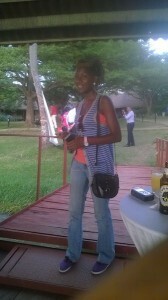 The invited guests were then transported to the picturesque lakeside resort of Kiboko Bay. This is a must-visit destination for tourists in Kisumu with its ‘island marina’, lakeside swimming pool and attractive Banda tents for accommodation. A table of flowing cocktails (alcoholic and non-alcoholic), snacks and bitings were provided to the guests. At this stage Okoth Obado of Redhouse Kenya (Jambojets’s marketing consultant) and Willem Hondius, Managing Director Jambojet, explained to the guests the rationale of the whole experience. They emphasized that Jambojet fares are really competitive especially when compared to road travel (time, wear and tear). However, the culture of last-minute travel bookings is still prevalent in Kenya hence most customers who could be benefitting from the low air fares were not due to not planning for trips in advance. Studies on the Kisumu route indicate that Monday and Tuesday bookings are low hence if booked early, travelers can enjoy the Kshs 2,950/= one way fare rising towards 3,950/= as the week progresses and as high as 5,950/= to 6,950/= on peak weekends and in the holiday season. Travelers to Western Kenya were mainly segmented as business on Monday/ Tuesday, and leisure, weddings, funerals and political betweenThursday to Sunday. Return flights over the weekend were invariably full. One of the ‘hijacked’ first-time travelers was also given a chance to comment on her experience and said she was overjoyed at the time differential in modes of transport compared to road shuttle. She was glad to be among the passengers given that she was carrying flower wreaths for a funeral which now got to Kisumu still fresh and fragrant as compared to if they had travelled by road and she promised to book JamboJet early for travel in the future. In order to beat the shuttle’s journey time, the function ended at 6 p.m. so that all guests could get to their homes before the shuttle arrived in Kisumu City. The evening function at the Mon Ami restaurant at the Mega Plaza continued with the same theme of encouraging marketing efforts towards encouraging early bookings, emphasizing that the increased use of internet bookings by passengers in developed economies (e.g. by Ryanair and Southwest), rather than use of traditional sales agents, had been a major factor in driving down fares. Jambojet competes with its parent company Kenya Airways, Fly540, and SAX on its current routes. Other routes that are under consideration include those to the ‘North’ (Wajir) and possibly Entebbe, following the collapse of Air Uganda. Key considerations for JamboJet to take on routes are airport size and facilities – and since the smallest aircraft in Jambojet fleet is the Q400, IOSA standards (as practiced by the KQ) and the need to additionally feed traffic into KQs network – rules out Nairobi’s other airport – Wilson. This entry was posted in Kenya Airways, Kenya domestic tourist on October 6, 2015 by bankelele.